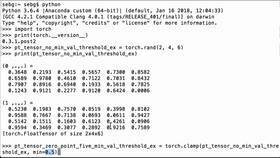 In this video, we will do element-wise multiplication of matrices in PyTorch to get the Hadamard product. 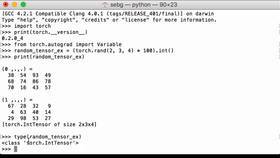 We will create two PyTorch tensors and then show how to do the element-wise multiplication of the two of them. 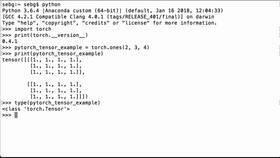 First, we create our first PyTorch tensor using the PyTorch rand functionality. The size is going to be 2x3x4. We’re going to cast it to an int and we’re going to assign it to the Python variable, random_tensor_one_ex. Let’s print our first tensor to see what we created. We see that it’s a PyTorch IntTensor of size 2x3x4, the numbers are between 0 and 10, and they are random. Next, we create our second PyTorch tensor the same way. This time, we’re assigning it to the Python variable, random_tensor_two_ex. Again, it’s torch.rand, 2x3x4, times 10, and casting it to an int. Let’s print our second tensor to see what we got. We see again that we have a PyTorch IntTensor of size 2x3x4, and it’s a random tensor that has numbers between 0 and 10. To calculate the element-wise multiplication of the two tensors to get the Hadamard product, we’re going to use the asterisk symbol. So we multiply random_tensor_one_ex times random_tensor_two_ex using the asterisk symbol and we’re going to set it equal to the hadamard_product_ex Python variable. And we see that it is between 0 and the biggest number looks to be 63. So if it’s element-wise, our biggest number should have been 9 or 10, so it could have been up to 100. Let’s check the last row. So here we see 5. So we should expect a 40. So we get a 21, which is what we would expect. We see a 6 and 8. Lastly, we see a 9 x 1. So using the asterisk symbol, we were able to calculate the Hadamard product of the two tensors. So it did the element-wise multiplication. The other thing to note is that random_tensor_one_ex was size 2x3x4, random_tensor_two_ex was 2x3x4, and our element-wise multiplication was also 2x3x4, which is what we would expect. That is how you can calculate the element-wise multiplication of tensors and matrices in PyTorch to get the Hadamard product.